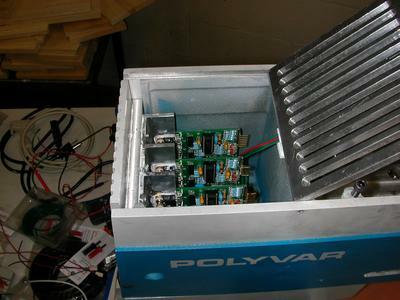 So the Hu Lab at University of Virginia is using our venerable Linistepper driver to move an imaging platform for biomedical research. Because the Linisteppers are /linear/ drivers (not choppers) they don't cause anywhere near the EM noise standard drivers put out. And the smooth stepping help increase their mechanical resolution. "We are developing a new biomedical imaging system, where a probe is installed on motorized stages so than we can scan the region of interest. ... The probe contains a ultrasound transducer which is very sensitive to free space EM noises. We tried some other drivers before, but they all gave very high free space EM noises. The Linisteppers, however, give little noise while provide very smooth scan with resolution less than 1 um." 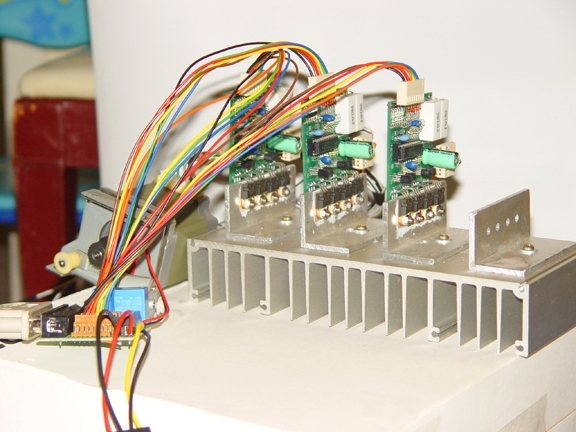 A very nice mounting by Matt Dwyer with 3 Linisteppers to run his Tiag Micromill via LinuxCNC Mach3. And a year later he says: " I've been running linisteppers on my Taig CNC mill for about a year now and it's been great! 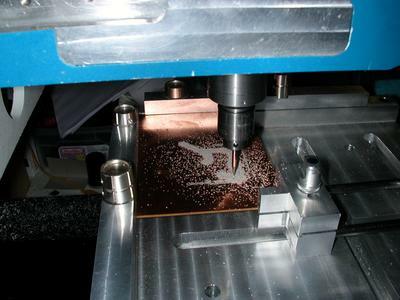 I moved to Mach3 instead of LinuxCNC as tool changes were a lot easier. " Matt isn't crazy about his top speed of 12 IPM, but he is only using 18 volts, so I've advised he raise the roof to 36 and ride out the heat. Should fly! John Bump has a very clean Sherline Mill CNC conversion and the Linsteppers move it very nicely with a smooth, clean sound. 'can't wait to see it cutting something! 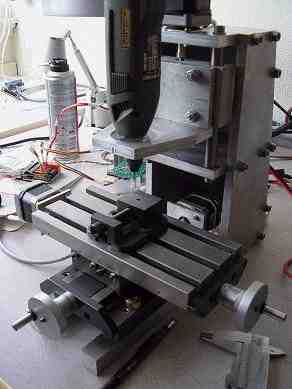 Andrew Hooper is running a rather large home built gantry CNC with a set of Linisteppers. He started out building his own Linisteppers by toner transfer and etching a single sided layout, but eventually decided to just buy our kit. As big as it is, it runs pretty quick: he has a video on his page you can check out: http://www.evilgenius.net.nz/diy-cnc-video/. 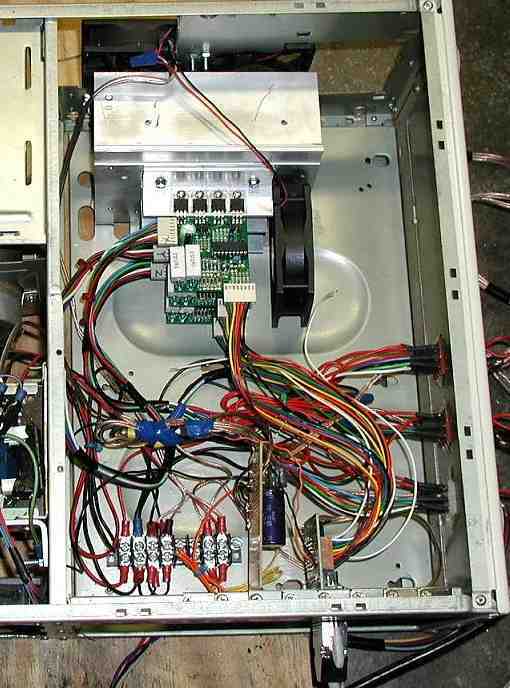 He is using a set of PC power supplies to provde 24V to the motors by stacking 12 volts from one supply on top of 12 volts from the other. I would worry about electical isolatoin, but he found a way to do it. Don't try this at home! 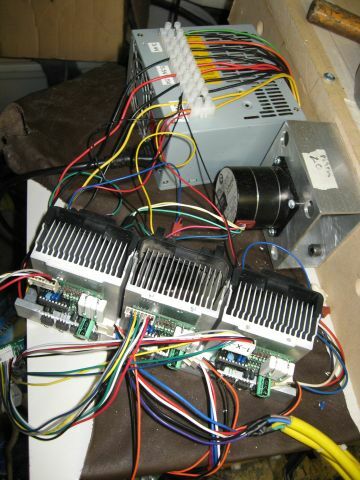 Chris Reynolds is using the V2 Linisteppers with CPU fans on his Harbor Freight mini-mill w/ Hoss Machine conversion. Chris says "... I really recommend these kits as they are very well thought out, easy to assemble, inexpensive, and open source." 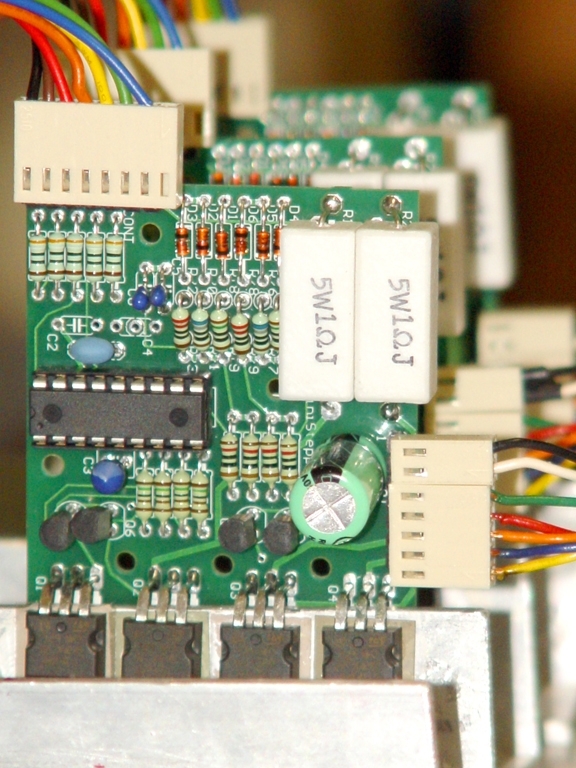 The Linistepper is a bit small for his motors, so he has added two 1 ohm 5 watt resistores (see them under the PCB?) in parallel with the supplied sense resistors to increase the supplied current and so far the CPU fans are keeping the drivers from overheating. They are putting out 2 amps per phase with that modification and his motors are rated at 2.8 amps, so he isn't getting every ounce of torque he could be, but for the price, he is happy with the performance. You can just see the 4 Axis board in the right corner. MarksLaboratory (.com) did a very nice review of the Linistepper V1 kit with the 4Axis kit and Mark got a color wheel stepping nicely. The CNC machine is almost finished (only some cover plates need to be finished up, and then it will be complete - but cover plates don't stop me from playing with it :) I have added some pictures of the CNC machine. 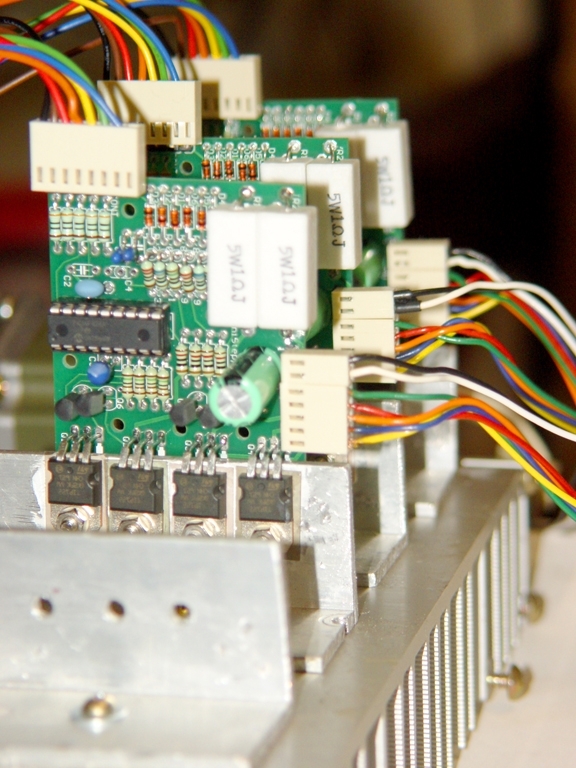 Unfortunately the linisteppers are mounted well inside the machine, so I took some pictures of them separately (they live on a swing-out heatsink). I also took some pictures of milling a PCB. I'm using a 0.020" end mill and the chuck is spinning, but the flash of the camera stops the action. I was originally told it was an electron scanning microscope, however someone who used to work on a similar machine at IBM recognized it as a wafer inspection machine. Sometimes these machines had microscopes on them, sometimes they had "bed of nails" testing jigs on them. It was used to inspect wafers before they were cut up into dice and put into chips. The microscope (or whatever) bits had been stripped before I got the machine. 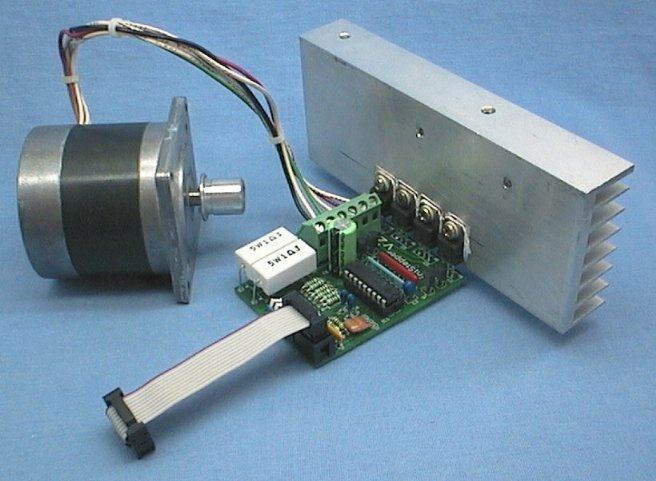 Every year I help the mechanical department at Vermont Technical College with some small electromechanical projects (I work in the computer dept. there). 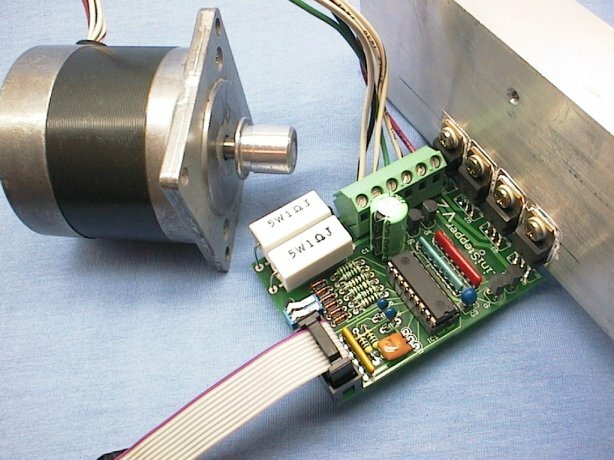 The students design a mechanical system with some stepper and DC motors. They give me the specs for what they need the motors to do and I program pics (usually 16F628's) to do the work. I usually donate about 80 hours over the course of a year to working with these students, even though they aren't in my department. The mechanical faculty really appreciate it, and so they asked me what I wanted. Money is hard to transfer between departments, so I said I wanted an NC drill machine to drill the custom circuit boards I make. While I can get boards made out of house at reasonable rates, there's nothing like having a working board that same day (or be able to find the stupid mistakes and fix the board that same day :). VTC gets donations of used equipment from various corporations from time to time. This wafer inspector was in there. The microscope parts had already been removed. The students made the table that has edge clamps and a corner clamp to hold circuit boards. They removed the servos (we didn't get the servo controllers) and found small but powerful steppers to replace them. 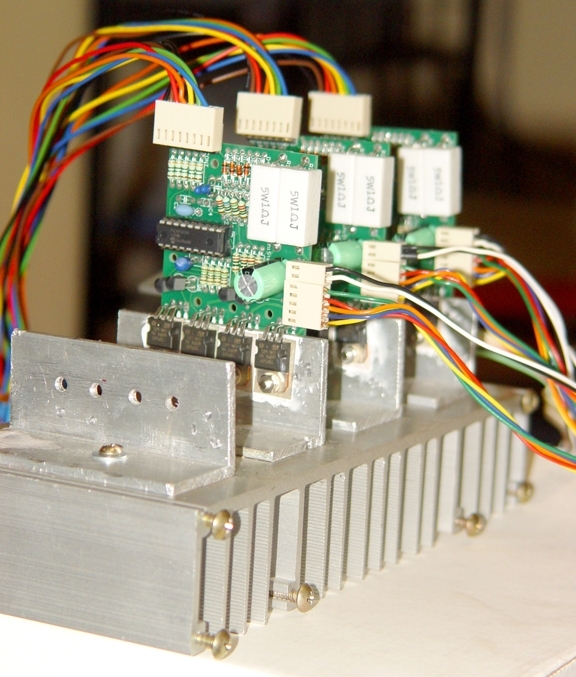 They made custom brackets to use the original servo motor clamps to hold the stepper motors. 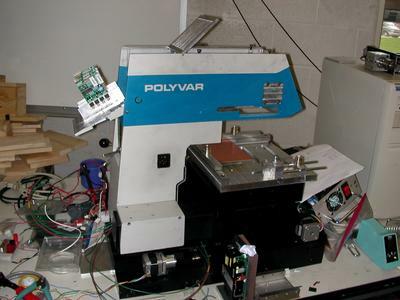 They took a pre-existing Z axis and machined it to fit in this machine and hold the drill motor (which is one of the original servos from the machine), They machined the heat sink in the back to have a flat surface, and it actually ducts the heat out to the sides of the machine as well. The flip up grill over the linisteppers they made as well. They also machined covers for all the holes on the machine where there used to be stuff that was removed before we got the machine. The X/Y table is original (and an absolutely beautiful platform with virtually no slop and very little drag). 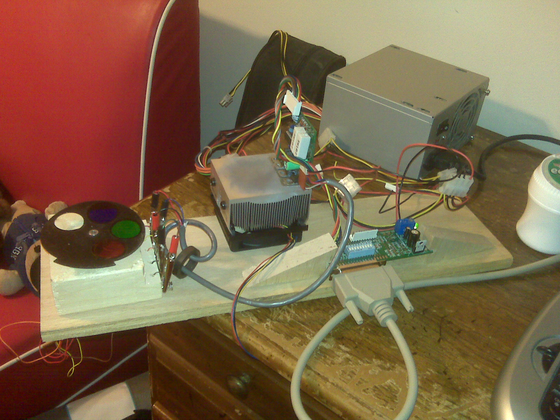 The table, Z axis, and steppers were added, along with the linisteppers. The x and y are on high power half steps. 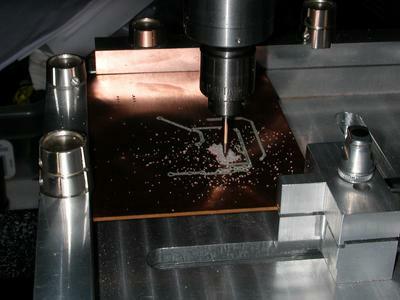 The Z axis is on the 9 microstep mode (for smoother drilling motion). I've milled a few boards with it. I'm learning to play with the settings to get it to come out well. Boards work great! Just got to the point where I can use the router ,need to do the finishing work on the router and the control box. Here's a few pics. 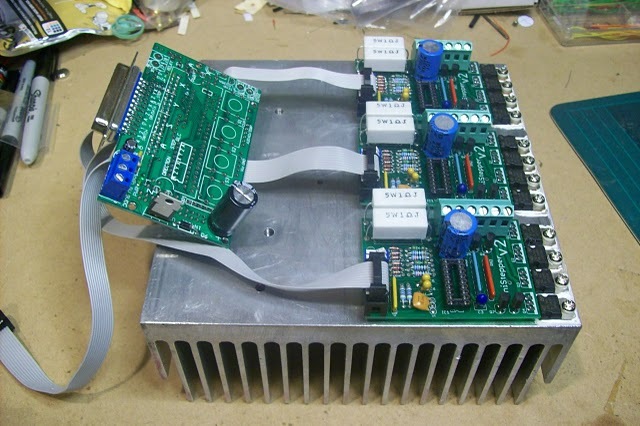 the new and improved heatsink assembly is 4 pounds of aluminum with dual 24 volt muffin fans! Coooooool! with 118 oz inch motors and 1/4-28 threaded rod at 5 ipm I'm getting 50 pounds of force on the axis! 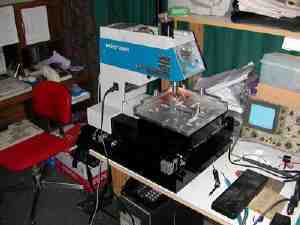 Jan Groen made this small milling and engraving machine. It is running on linisteppers and you can hear the soft sooth whine in this video. This was one of its first runs... Right click and select play to see the video. check your volume first! Johan converted this Wabeco mill to CNC. 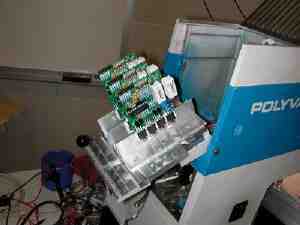 His machine is working very well; running MACH 2 software with linistepper drivers. 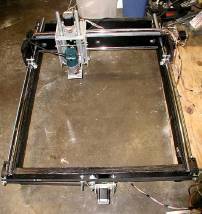 He is one of the few people actually doing 3d cnc milling and the results look impressive! These linis are running 3 1.8' steppers from Kelly ware, Mach 3 with power from a pair of old PC power supplies. One for 2 of the motors and another for the 5v to the linis, the other motor, and a couple of fans. 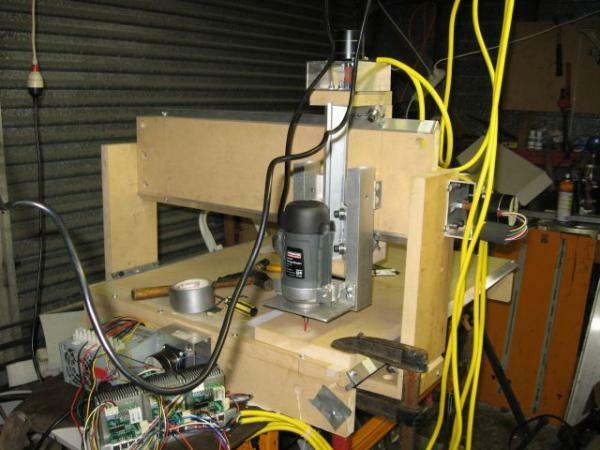 This cute little machine was made from an XY table bolted to a home made tower. 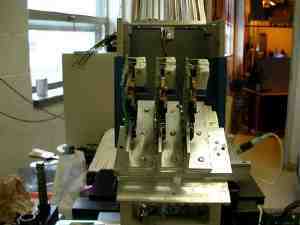 This machine has been built with the stepsyn motors and ball bearings from K.P. Damen of www.damencnc.nl. It is used for making model airplane parts. 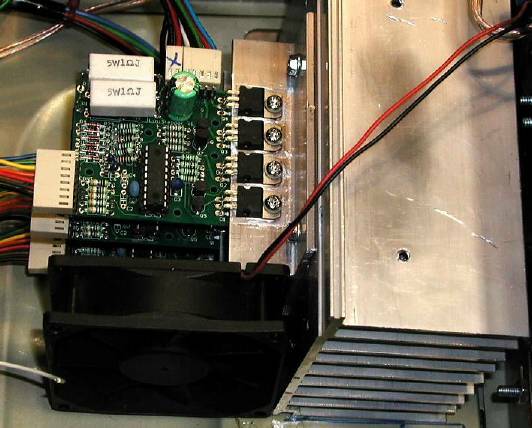 Chad Richardson has his up and running, but he needs a much bigger heatsink on those power transistors before he puts it into microstepping mode or loads up the motor. Chad says "I like your Linistepper control boards. I think the quality is great and the price is very nice as well. The kits are a really good value." 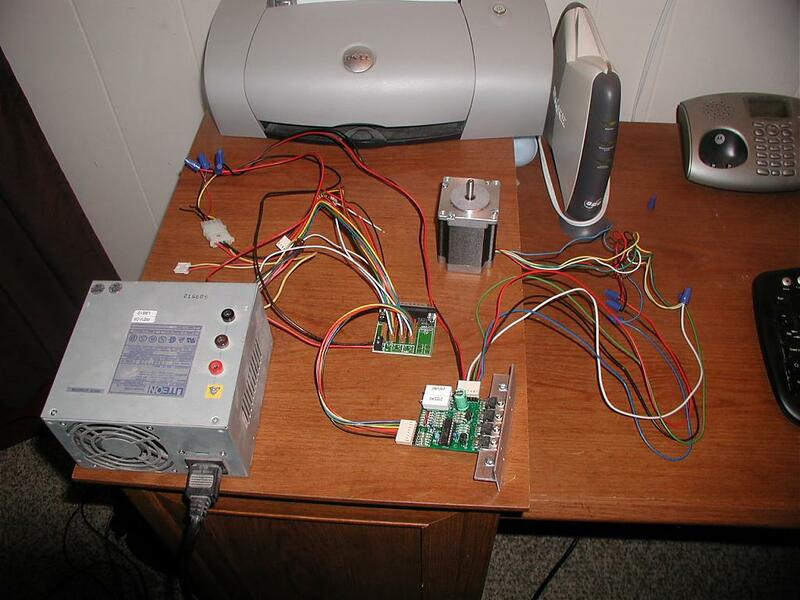 Here is an update from Chad: He has a very nice LARGE machine up and running with 3 linisteppers mounted in an old PC case with a good sized heatsink and fan. Chad says: "The Linistepper controllers are mounted to a large heat sink. I also mounted fans to blow across the fins. I burned up a set of transistors because I didn't have it connected well... 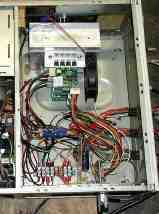 I'm running my [Probotix HT23 200-6] motors at 34 volts and 1 amp. They run great haven't gotten hot." http://www.evilgenius.net.nz/diy-cnc-xyz-table/ Andrews big MDF machine. He started with home made PCBs, and purchased the kits later to add more axis.